Although St. Mary Mead is now permanently established as the fictional village home of Miss Marple, it was first used by Agatha Christie in a slightly different way. In The Mystery of the Blue Train (1928), which was largely written during the break up of her marriage and just before Miss Marple came into being, St. Mary Mead was used as the name of a village in Kent. Before that novel was published, Christie had begun writing the first Miss Marple stories and transferred the village of St. Mary Mead to them. Miss Marple’s St. Mary Mead was to go on to feature in many world-famous novels and stories, while St. Mary Mead in Kent never appeared again. The Mystery of the Blue Train, which Christie could barely bring herself to mention because of its unhappy personal associations, was disowned by her, emotionally at least. Miss Marple’s St. Mary Mead was not located topographically by Christie in any recognizable manner. Instead, it was placed within a fictional county that was usually called Downshire, though sometimes Radfordshire, while the towns and cities around it were also given fictional names. This can make it sound as though Christie was creating a Never-Never land for the Miss Marple stories, but that, of course, was not the case, nor has it ever been felt to be so by her devoted readers. Occasionally she would introduce real places into the novels, most notably London, but also for example, Eastbourne, Bournemouth, and The Isle of Wight. They did not usually play any substantial part of their own, but served primarily to anchor the fictional community that had St. Mary Mead at its centre. This is done so skilfully that the reader doesn’t usually experience any kind of serious uncertainty as to where abouts, approximately, in England St. Mary Mead is situated. The toying with place names quickly became a characteristic technique of Christie’s, a key part of her larger literary method in which timelessness and precise social detail are effortlessly combined. It was used by her with considerable, if sometimes curious, effect. Here is Anne Hart, Miss Marple’s first biographer in The Life and Times of Miss Marple (1985), trying to pin down where the reader can expect to look for St.Mary Mead while at the same time playfully drawing attention to Christie’s conscious mix of real, imagined, and half-recognizable places It is, she writes, ‘about twenty-five miles south of London and twelve miles equidistant from Market Basing and the coast at Loomouth. Danemouth, a fashionable watering place also on the coast, is about eighteen miles from the county town of Much Benham and it, in turn, is two miles from St. Mary Mead.’ In other words, St. Mary Mead is to be found somewhere about half-way between London and one of the nearer spots on the south coast, most probably in Sussex, a total distance from London of some fifty-odd miles. And that is about as near as one can expect to get. There have been attempts to fix more exactly where St. Mary Mead is to be found, and to identify it with particular villages, mainly for film or televisual purposes, but they get little help from Christie. Her village is archetypal rather than actual, and she pays to it only the topographical or sociological attention needed to provide a convincing setting, or more often a starting point, for one of Miss Marple’s adventures. Much of this applies equally to the related assumption, occasionally advanced, that St. Mary Mead is to be found in Hampshire. This is based partly on the case that the fictional town of Market Basing, used by Christie in several novels and stories, refers to Basingstoke (as perhaps it does) which is in Hampshire. And also, and, more substantially, on suppositions drawn from the basic plot of 4.50 from Paddington (1957). In that novel, Mrs McGillucuddy witnesses a murder on a passing train while on her way to visit her old friend Miss Marple in St. Mary Mead. Mrs McGillicuddy’s train departs from London’s Paddington Station, so it is sometimes assumed that she must be moving west of Sussex into Hampshire. And all of this might make sense, except that it ignores Christie’s obsessive, and perfectly deliberate, use of fictional rather than real place names. For a start, the station loudspeaker announcements at Paddington direct passengers entirely to fictional places, some of which (including Market Basing) may be in Hampshire but which, even so, they can only reach by changing trains. Mrs McGillicuddy herself doesn’t finally travel to St. Mary Mead by train. She changes trains at Milchester (wherever that is supposed to be) and completes her trip with a nine-mile taxi journey to St. Mary Mead, in a direction that is never given. However, we do learn elsewhere in the Miss Marple novels that the railway that services St. Mary Mead doesn’t connect directly with London, but is a branch line linking with the nearby larger town of Much Benham, which is of some importance in several of the novels. It is truly difficult, given Christie’s inbuilt mystifying methods, to reach any firm conclusions about where exactly on a map of southern England any of these places, including St. Mary Mead, are to be found. And things stayed like this for much of Miss Marple’s career. But in the post-war years Christie began slowly to make significant changes to her murder mysteries, the Miss Marple novels especially. They remained as entertaining as ever, but began to rely less on the tight narrative pattern she had developed throughout the 1920s and 1930s, in which the mystery itself dominates every other aspect of the story, and began instead to give more attention to the radically changing social and political nature of Britain, something she had hitherto steadfastly held off from doing. Now, both Miss Marple and Christie herself have no hesitation in making their feelings and opinions known about modern Britain. In the post-war novels, juvenile deliquency comes under their scrutiny, and post-imperial Britain as represented by the West Indies, and modern large-scale crime in London. So, notably, does St. Mary Mead. The Mirror Crack’d from Side to Side (1962) opens with Miss Marple, at home, very much feeling her age, looked after by an irritating home-help Miss Knight, upset that she can no longer work in the garden, and pondering the vast changes that have come to St. Mary Mead. ‘The old world core of it’ remains much the same, but all around ‘progress’ is in evidence. Americanization is a key part of the modernizing process, with the glamorous film star Marina Gregg and her Hollywood entourage bringing Hollywood to St. Mary Mead. They also introduce the principal murder element of the novel as well as a range of cultural amd social influences that were being felt everywhere in Britain in the years following the war. In St. Mary Mead, not only are the village houses and shops being modernized, but a controversial supermarket, very much a sign of Americanization, has suddenly appeared on the high street. Miss Marple observes all of this and strives to understand it, but she is more concerned with ‘The Development’ which is being built at the edge of St. Mary Mead. Its specialness is obvious, Miss Marple tells herself in some puzzlement, in the way it is spoken of. Always a complete sentence in itself, that and nothing more: ‘The Development, Period. As they would say in modern terms. It had an entity of its own, and a capital letter.’ In studies of Agatha Christie ‘The Development’ is always referred to as being a housing estate, a visible sign of the rapid urbanization that was taking place everywhere in Britain in the 1950s and 1960s. But that is surely not right. It is much more than simply a housing estate as Miss Marple herself realizes. What is opening up on the borders of her village is an entirely new world. It is planned community, with shopping centres, light industries and people being brought systematically in from other parts of the country to live and work there. The houses are ‘different.’ On top of them, television arials are evident, and the ‘streets’ are for some unknown reason often called ‘Closes.’ The people themselves are largely young, often families, the young mums, wearing pretty dresses or trousers, and pushing prams. One of those young married women, Cherry Baker, comes in to do housework for Miss Marple, and she is bright, lively and efficient, as well as being pretty and well dressed. A vast improvement, Miss Marple acknowledges, on all those rather ill-informed and poorly educated housemaids she had known in the past. If Mrs Baker from The Development represents ‘progress’ then Miss Marple is ready to be impressed. But she needs to learn more, and mustn’t just rely on what other people are saying. She must go and see The Development for herself. Carefully arranging to get the domineering Miss Knight out of the way, Miss Marple sets off. The journey is easy enough, for The Development is just a short walk away from St. Mary Mead, along a footpath and over a little bridge. Even so, she feels like ‘Columbus setting out to discover a new world.’ The hyperbole is perfectly appropriate, and Miss Marple is not disappointed with what she finds. She immediately has an adventure, of course, and runs into a brand new murder mystery. But for her the most exciting thing of all is to realize that the people of the Development may look and sound differently from the local village people whose ‘human nature’ she has studied all of her life, but in fact they are fundamentally no different from anyone anywhere else. Miss Marple the detective has confronted the modern world, as epitomized by the Development, and is still in business. So what exactly is the Development? Probably the biggest single task of reconstruction for post-war governments in Britain, initially Labour under Clement Attlee but then Conservative as well under Winston Churchill, was how to provide sufficient housing for a population which had been not only devasted by bombing during the war but also treated with neglect for years before. One important part of the solution of Britain’s massive housing problem was to build a series of New Towns throughout the country. The ideals as outlined in the New Towns Act of 1946, was to create clean healthy urban environments in rural areas, controversially absorbing large numbers of traditional villages in the process. 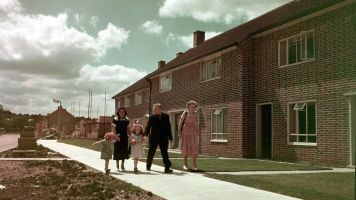 Industries as well as families were encouraged to move to these new towns, the plan being to create socially mixed communities, models for how life in Britain could be. With such complex planning involved, the New Towns were slow to get started, but by 1961 twelve of them had been designated. They started with Stevenage in Hertfordshire in 1946 and Crawley in Sussex the following year. Crawley New Town, set on the border with Surrey and situated roughly halfway between London and Brighton, was planned to absorb the small town of Crawley and two local villages Three Bridges and Ifield. By 1962 both Stevenage and Crawley were visibly expanding and it was in this year that Christie published The Mirror Crack’d from Side to Side, in which St. Mary Mead, her achetypal English village, already in a process of rapid change, feels threatened with invasion by modern life in the shape of the Development. And the Development is, surely, not just any housing estate, but Crawley New Town. Of the New Towns, it has to be Crawley because that was the only one of them built south of London. It is true that Christie herself never identifies the Development with Crawley, but then, as we have seen, it had long been part of her conscious practice as a novelist to evoke immaculately real settings but not to use real names for them. After all, this was what she had done with St. Mary Mead, establishing a village situated approximately 25 miles south of London, whose actual location has never been convincingly identified. Christie now followed the same kind of method with Crawley New Town. There was, though, an important difference. In her later years as an author, Christie became increasingly allusive, given to scattering clues and hints as to what she was really up to, a perfectly fitting technique for one of the most mystifying of all writers of murder mysteries. Christie was still not actually identifying St. Mary Mead, but she was certainly placing Miss Marple’s village more precisely than she ever had done before. She also laid other significant clues in the novels of this late period. In 4.50 from Paddington (1957) Miss Marple says that St. Mary Mead is now ‘quite close to an airfield, you know, and really the way those jet planes fly over! Most frightening. Two panes in my little greenhouse broken the other day.’ And in At Bertram’s Hotel (1965) we learn from Lady Selina Hastings that during the war she had ‘taken a small house in the village of St. Mary Mead’ while her son was ‘stationed at an airfield nearby.’ These two references in novels published one on either side of The Mirror Crack’d, have to be allusions to Gatwick which in the 1930s had been a very small airport. During the war it was expanded and used by the RAF. Afterwards there began the rapid expansion that has turned it into the big commercial airport it is today. Gatwick is situated three miles north of Crawley New Town. It is obvious that none of this can possibly apply to the location of St. Mary Mead in the early days of its literary existence. The New Towns had not even been thought of when the first Miss Miss Marples stories and novels were published, though it is still possible that Christie had this kind of locality in mind from the beginning, as Anne Hart suggested in the passage already quoted. 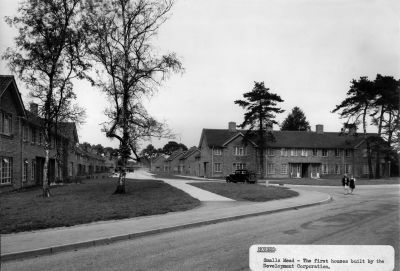 After all, then and now, Crawley New Town, like St. Mary Mead, is roughly halfway between London and the south coast, some fifty-odd miles in total, as also was the spot chosen by post-war planners for Crawley New Town. Even so, the present argument can, strictly speaking, only have any immediate relevance to the post-war period, and in that conection there is one further clue to add. By the time Christie published the very last Miss Marple novel Nemesis in 1971, ten years on from The Mirror Crack’d, she was confident enough to allude to the location of St. Mary Mead as quite settled, though still without naming Crawley New Town, or the Development. In Nemesis Miss Marple wants to visit Esther Walters with whom she had been involved in the earlier A Caribbean Mystery. With a topographical precision extremely unusual for Christie she uses real-place names for each stage of the journey, except, of course, for the starting point St. Mary Mead which we can now assume would be at least in the close vicinity of Crawley New Town. It is difficult to see where else it could be. Bouyed up by the unusual luxury of an expenses account from the late Mr Rafiel, who had also played an important part in A Caribbean Mystery, Miss Marple decides she can afford to take a taxi. Her journey is from East to West travelling across southern England. Esther is now living in Alton, Hampshire which Miss Marple estimates is twenty-five miles (or about one and a half hours by taxi) from St. Mary Mead. To make a rather special day of the trip she decides to make a slight southerly detour to stop in Haslemere, Surrey, for lunch. Her journey back, without the detour, would presumably take less time but it would still involve three counties, and have her arriving back in St. Mary Mead, just across the border with Surrey or, in other words, Crawley. The attempt to try to establish a specific locality for St. Mary Mead has long been a matter primarily of antiquarian interest. It can, though, be quite a bit more than simply that. Once the issue is opened up it can be seen to involve aspects of Christie’s work that have been left unchallenged for far too long. Especially pertinent is the common assumption that there is no real substance to Christie’s work, that she brings to them little interest in history or politics or much else of modern life, come to that. If the Development, as presented in The Mirror Crack’d truly is a a portrait of Crawley New Town, and Miss Marple’s voyage of discovery, like that of Columbus himself, is in search of a new world, then it demonstrates that Christie’s understanding of the changes taking place in post-war Britain was quite a bit deeper than is usually allowed. And more realistic as well in ways that are not usually credited to Christie. Her view of the way of life being pioneered in Crawley, and of most of the inhabitants, is overwhelmingly positive but by no means idealistic. Not everyone who moved to the New Towns was happy with the changes. Some were nostalgic for their earlier environments, some distrusted the newness of everything around them, and, for one reason or another, some people wanted to stay for only a short while. Cherry Baker is one of the most admired characters in The Mirror Crack’d and in herself a splendid advertisement for the Development. Yet she and her husband are unhappy with the lack of privacy they have in their new house, the thinness of the walls, and the complaining nature of their neighbours. Her suggestion that they move across from the Development to St. Mary Mead and live independently in the spare rooms Miss Marple has, so that they can gain more privacy and at the same time look after her, is happily accepted, and works well, a perfect blend of old and new. And perhaps it is not too neat to suggest finally that the blending of old and new is a particularly appropriate theme for this placing of the tiny traditional village of St. Mary Mead with its ‘little nest of Queen Anne and Georgian houses’ on the edge of bustling, modern Crawley New Town. For, after all, if the argument outlined here is correct, then there will be no further point in trying to find a location for St. Mary Mead, and not simply because the puzzle has now been solved. In The Life and Times of Miss Jane Marple, conjecturing on a possible future fate for St. Mary Mead, Anne Hart asks whether, as urbanization increases, ‘as Development follows Development’, would St. Mary Mead ‘disappear entirely into the boundaries of an unsuspecting Much Benham?’ And that prediction is surely correct, except that the absorption was to be at one and the same time far greater and more specific than Hart realized. Back in1961 St. Mary Mead was already only a four minute walk away from modernity. By now, a half-century further on, it will no longer exist in its own right at all, but have become at best one of a large number of barely distinguishable neighbourhoods of Crawley New Town. Like the original Sussex town of Crawley from which the New Town took its name, St. Mary Mead, was fated, as Christie well understood, to become not just a part of modernity but to be completely absorbed by it. The photographs are reproduced by courtesy of Crawley Borough Council.